Apple’s iCloud service has had its share of outages and issues, but the latest problem, while apparently limited to a subset of accounts, just might be the most frustrating yet for those affected. Starting on or around September 18, some iCloud customers found that apps that use iCloud to sync data between devices could no longer do so—they either no longer sync or appear to have lost their data completely. The apps otherwise function normally, but simply don’t show any saved information or cannot update or sync existing info. The issue doesn’t just affect third-party iOS apps—it also affects Apple’s own software, including some OS X apps. For example, some users are reporting that OS X apps that store documents in the cloud, such as TextEdit, Pages, and Preview, currently show no documents available when you choose File > Open and switch to iCloud view; similarly, iCloud-saved documents no longer appear in the File > Open Recent menu. Apple’s System Status webpage has yet to indicate any iCloud issues. What’s made the issue so frustrating for affected users is that other iCloud-hosted services, such as email, contacts, and calendars, continue to function normally, and even allow third-party apps to sync with them. (Behind the scenes, that’s because these services, though also part of iCloud, use a different system than Documents & Data syncing.) In fact, if you don’t use more than one or two iOS apps that sync data using iCloud, it’s easy enough to assume that the app is at fault. For example, I first noticed the issue when I discovered that my movie list in TodoMovies was blank. As the problem started soon after I updated my iPhone to iOS 7, I assumed it was a bug with the app and iOS 7, so I contacted the developer, who couldn’t reproduce the problem (and apparently hadn’t yet received enough reports of problems to realize that we were seeing an iCloud issue). While the issue clearly isn’t affecting all iCloud users—or even most, it appears—it’s generated a number of lengthy discussions on Apple’s Support Communities forums. User Grant Grueninger has provided perhaps the best summary, including some more details about what’s going on behind the scenes. Open the Console utility (in /Applications/Utilities). 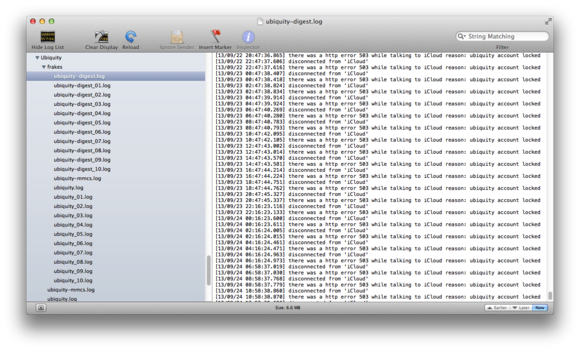 In the file list on the left, find ~/Library/Logs; click the arrow next to it to view the list of log files. Scroll down to locate a folder called Ubiquity; click the arrow next to it to view its contents. Under Ubiquity, find your username; click its arrow to view its files. Under your username, locate the file named ubiquity-digest.log (with no number after digest); click it to view its contents in the main Console window. Scroll to the bottom of the text. Scroll down and tap Storage & Backup. 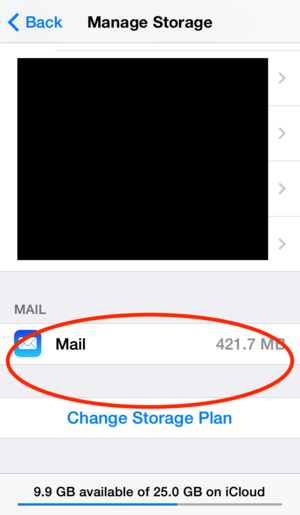 Normally, any apps that use iCloud to store or sync data are listed here, along with how much space their data is currently using. However, affected users will see only device backups and Mail. While this issue has been frustrating for users, it’s also been challenging for developers who rely on iCloud for storing and syncing their users’ data. Because the issue happened so close to the release of iOS 7 and new iPhone models; because there’s no easy way for a developer to determine if a particular user’s iCloud account simply isn’t syncing; and because many users aren’t having problems, it’s been difficult for developers to troubleshoot user reports—or even to realize that this is a wider, iCloud problem, rather than random sync issues. If you're affected, you'll see no app data in iCloud's Manage Storage screen. Unfortunately, before discovering that the issue was being caused by a larger iCloud issue, some developers recommended standard app-troubleshooting procedures, including deleting apps and reinstalling them, and even asking users to create new data and attempt to sync with iCloud to “jump start” a sync. In theory, the original data is still in iCloud and will be restored to these apps once Apple fixes the issue, but there’s always a chance that new data created for troubleshooting reasons will overwrite what’s in iCloud, depending on how each app handles sync and that app’s sync status at the time the problem started. What can you do if you’ve been afflicted with this issue? Other than contacting Apple Support to let them know that yours is one of the problematic accounts, not much other than to wait for the eventual fix. Speaking of which, Apple support personnel have indicated—in phone, chat, and email exchanges with affected users—that Apple is aware of the problem and is working on a solution (though Apple’s System Status webpage still doesn’t indicate any iCloud issues). On Apple’s support forums, many users have reposted messages they’ve received from various support personnel. Indeed, some users on Apple’s Support Communities forums have reported that their accounts are again working normally, though at the moment, for every such report, many more new complaints are appearing. At the time of publication, Apple had not yet responded to a Macworld request for comment. We’ll update this article with any such response. Update: Late in the day on 9/26/2013, and continuing through 9/27/2013, many affected users reported that iCloud syncing began to work properly, and iCloud-hosted data was again accessible. By Saturday, 9/28/2013, most accounts appeared to be back to normal. Apple's support representatives indicated that for most users, the problem should go away without any further action; for others, Apple has suggested that updating iOS devices from iOS 7.0 or 7.0.1 to 7.0.2 should fix the problem. Updated to note that the problem has apparently been fixed.